It is not just the analytic power of R that you get from using SQL Server R Services, but also the great range of packages that can be run in R that provide a daunting range of graphing and plotting facilities. Robert Sheldon shows how you can take data held in SQL Server and, via SQL Server R Services, use an R package called ggPlot that offers a powerful graphics language for creating elegant and complex plots. In SQL Server 2016, Microsoft added support for the R language in two different forms: SQL Server R Server, a stand-alone product that provides parallel processing and other performance enhancements, and SQL Server R Services, an integrated service that lets you run R scripts directly within the SQL Server environment and incorporate SQL Server data within those scripts. This article is the second in a series about SQL Server R Services. In the first article, I explained how to use R Services to run R scripts within the SQL Server environment. To do so, you must use the sp_execute_external_script system stored procedure to run the script, including it as a parameter value when calling the procedure. The first article provides a number of examples of how to go about doing this. In this article, I focus on the R script itself, using a single example that demonstrates how to generate a bar chart (also known as a bar plot in R lingo). The article walks you through the script one element at a time so you can better understand the various elements that make up the script, while gaining a foundation in many important concepts related to R scripting. When calling the sp_execute_external_script stored procedure, we’ll take the same approach as in the first article; that is, we’ll save the R script and T-SQL SELECT statement to variables (@rscript and @sqlscript, respectively). We’ll then use those variables as parameter values when calling the procedure. We’ll also be running the procedure within the context of the AdventureWorks2014 database because it will provide our source data. If you read the first article in this series, the components of the procedure call should be familiar to you. We start by defining the R script and assigning it to the @rscript variable. Next, we define the SELECT statement and assign it to the @sqlscript variable. Finally, we call the sp_execute_external_script stored procedure, specifying the @language value as R, the @rscript value as @rscript, and the @input_date_1 value as @sqlscript. We also specify that no result set be returned. Instead, we’ll be generating a .png file that contains our bar chart. The remainder of the article walks you through each section of the R script: importing R packages, setting up the report file, constructing a data frame, and generating the bar chart. If you have any questions about the non-R elements in the example, be sure to refer back to the first article. The first part of our code imports two R packages from the local SQL Server library into the scripting environment. 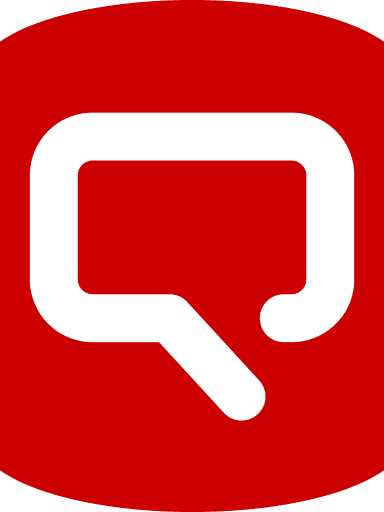 Packages are collections of functions or data sets in the SQL Server R Services library. When you install R Services, SQL Server setup adds a number of common R packages; however, you can install additional packages at any time. Once a package has been installed in the library, you can import it into your scripting environment in order to use its functions or data sets within your R script. In our example, we’ll be importing the scales and ggplot2 packages. Before we can do that, however, we must install them into the SQL Server R Services library. Any package we import must exist in the library. Fortunately, we can get both packages by installing the ggplot2 package. When you install this package, R Services installs several additional packages, including scales. If you’re working with a named SQL Server instance, simply replace MSSQLSERVER with the name of that instance. lib.SQL <- "C:\\Program Files\\Microsoft SQL Server\\MSSQL13.MSSQLSERVER\\R_SERVICES\\library"
All you’re doing here is specifying where the target SQL Server library is located and then using that location when running the install.packages function. R Services takes care of the rest, checking for an available download server, pulling the files from that server, and installing the package into the library. The following figure shows the RGui utility after running the install.packages function. Your results might be different, depending on the download server used. That’s all there is to installing a package in the SQL Server library, assuming you can connect to the Internet. If you can’t, you’ll have to take a different approach. 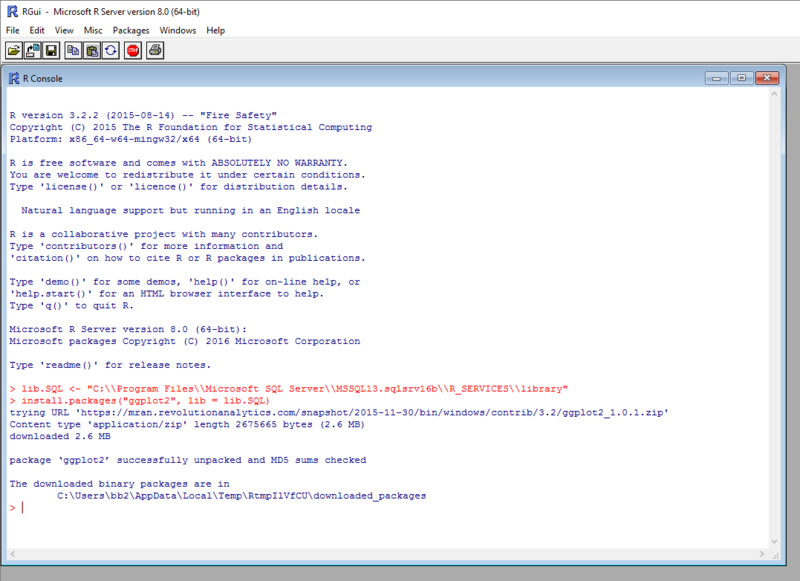 For more information, see the Microsoft article Install Additional R Packages on SQL Server. Once we’ve imported the packages, we can use their functions in our script, which we’ll be doing later in the script, when we define the bar chart. Next, we call the png device, which is used to create the .png file for our bar chart. The R language provides devices such as png, bmp, and tiff for creating plots and image files in various formats. In this case, when calling the png device, we specify the reportfile variable for the folder and file names and then provide a width and height for the file, in pixels. That’s all there is to setting up our graphic file. After we add the bar chart, we’ll need to close the png device, using the dev.off() function, but we’ll get to that later in the article, after we define our bar chart. Before we can create the bar chart, we must get the data we want to visualize into a data frame. A data frame is similar to a database table. Strictly speaking, it is a list of vectors of equal length that are assigned the data.frame type, but to keep in simple, we can think of the data set in terms of rows and columns. We start by assigning the values for the first column to the c1 variable. To get the values, we use the levels function to retrieve a distinct list of values from the SalesTerritories column in the sales data set. Notice that we must first specify the sales variable, then a dollar sign ($), and finally the SalesTerritories column. Next, we assign the values for the second column to the c2 variable. This time, we use the tapply function to return the aggregated subtotals for each territory. The function takes three arguments. 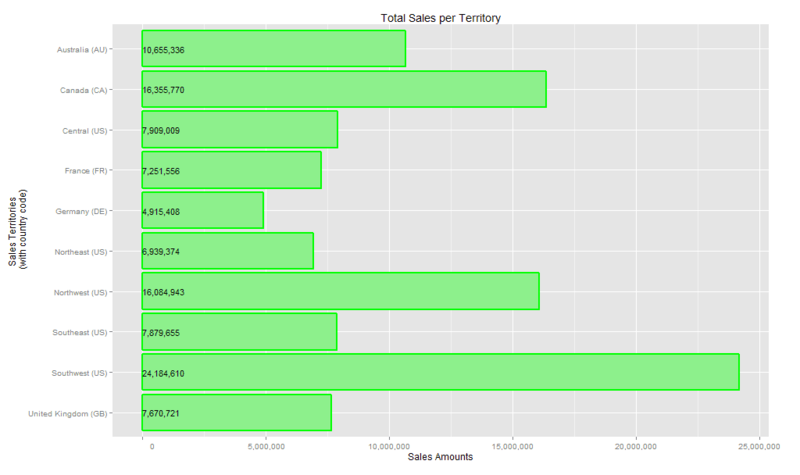 The first is the Subtotal column in the sales data set. The second argument, sales$SalesTerritories, contains the factors used for aggregating the subtotals specified in the first argument. In other words, the second column provides the basis (territories) for how the values in the first column (subtotals) will be grouped together and aggregated. The third argument, sum, is an aggregate function that adds together the subtotals in each territory to produce a total for each group. Notice that we also use the round function to round the aggregated totals to integers. In the first line of code, we use the data.frame function to merge the two columns into a data frame, which we assign to the salesdf variable. In the second line, we use the names function to assign names to the salesdf data frame. To do so, we use the c function to concatenate the column names, Territories and Sales, and then assign the results to the data frame. That’s all there is to creating our data frame. As you become more adept at the R language, you’ll be able to perform far more sophisticated calculations. But for now, let’s see what we can do with the data. The function’s first argument, salesdf, is the data frame that provides the data for the bar chart. The second argument uses the aes function to define the default aesthetics used by all layers in the chart, unless specifically overridden within a layer. In this case, the aes function merely defines the chart’s X-axis and Y-axis (Territories and Sales, respectively), which coincide with the columns in the salesdf data set. All we’re doing here is passing three arguments into the function, one for each label. One thing worth noting, however, is the \n in the X-axis label. This inserts a line break into the text. By using the labs function, we can override the default labels that would normally be used, as specified in the ggplot function. The function takes four arguments. The stat="identity" argument ensures that data values map correctly to the plot points. The color argument sets the bar outlines to green, the size argument sets the bar outlines to 1 point, and the fill argument sets the main color of the bars to light green. We’re taking this approach because flipping the X-axis and Y-axis resulted in the territory names being listed in reverse order (from down to up). To fix this, we first use the levels function to retrieve a distinct list of the territory names, and then use the rev function to reverse their order. We then wrap all this within the xlim function to ensure that the values are correctly mapped to the reversed labels. The scale_y_continuous function lets us refine the labels used for the Y-axis aesthetics. In this case, we’re creating the x function as the value for the labels argument, and then using the format function to modify the x function, adding commas to the numerical values and ensuring they’re not rendered as scientific notation. The format function takes three arguments. The first specifies the x function as the object being formatted. The second argument (big.mark) specifies that a comma be used for large numerical numbers. The third argument, scientific, specifies FALSE to prevent scientific notation from being displayed. The function takes four arguments. The first argument, label, uses the aes function, which itself takes three arguments. The first specifies that the Sales values be displayed, using the comma function to add commas to the numeric vales. The ymax and ymin settings specify the upper and lower pointwise limits of the displayed value. You must include these two arguments, but you can experiment with their settings, particularly ymax. The size argument of the geom_text function specifies 4, which sets the font size to 4 points, and the hjust argument specifies 0, which left-justifies the labels. Finally, the position argument uses the position_fill function to ensure that the labels appear on top of the bar, rather than off to the right. If you were to now run the script, calling the sp_execute_external_script stored procedure as defined in our example, the SalesReport.png file will be created in the designated folder. When you open file, you should see an image similar to the one shown in the following figure. As you can see, the SQL Server data has been aggregated and rendered in the chart, providing us with the total sales for each territory. Notice that all the numerical values are rounded and include commas to make them more readable. Not surprisingly, we can do a lot more with both the data and the visualization in our example. We can modify the bar chart to change how data is displayed, or we can try different types of visualizations. Because it’s so easy to generate a graphic file, we can play around with the code as much as we want to see what we can come up with. In fact, this is often the best approach to learn R because much of the documentation is very unclear. Sometimes the only way to understand how a language element works is to try it out. Although the example we’ve been working here is very basic, it should help you better understand some of the language elements that go into analyzing and visualizing data. In future articles in this series, we’ll dig deeper into both the analytics side and the visualization side. Until then, you have plenty here you can play with, so dive in and start having some fun. SQL Prompt is an add-in for SQL Server Management Studio (SSMS) and Visual Studio that strips away the repetition of coding. As well as offering advanced IntelliSense-style code completion, full formatting options, object renaming, and other productivity features, SQL Prompt also offers fast and comprehensive code analysis as you type. After being dropped 35 feet from a helicopter and spending the next year recovering, Robert Sheldon left the Colorado Rockies and emergency rescue work to pursue safer and less painful interests—thus his entry into the world of technology. He is now a technical consultant and the author of numerous books, articles, and training material related to Microsoft Windows, various relational database management systems, and business intelligence design and implementation. He has also written news stories, feature articles, restaurant reviews, legal summaries, and the novels 'Last Stand' and 'Dancing the River Lightly'. You can find more information at http://www.rhsheldon.com. Is there a way to return the generated chart image as binary data rather than writing to disk? I would like to execute a procedure from a web application running on a different server, and simply get the image back without having to save to disk or deal with file system access from the web server. The example is using the native hist chart function in R, rather than ggplot. If you use ggplot, you also have to call the print statement before calling dev.off like in the examples above.